Wee Gers busy on deadline day! The highly-rated 20-year-old has featured at various youth levels for Scotland and has been a regular for Killie’s Scottish Youth Cup Development Team, who recently progressed to the semi-finals of the Scottish Youth Cup. After that spell Devlin returned to Scotland to rejoin Kilmarnock, signing a three-year deal which will see him remain at Rugby Park until at least 2019. With first-choice goalkeeper Kevin Walker currently sidelined with a shoulder injury sustained warming up for the recent clash away to Arbroath, Devlin will provide both cover for the injured Walker and competition for Sean Brennan, who has been deputising in Walker’s absence. 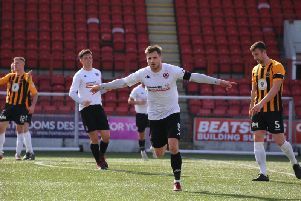 Meanwhile, boss John Coughlin has agreed terms with Dutch pair Donker and Kessells, who had both been training with the Glasgow-based Next Level Soccer Ltd. The pair had agreed deals last week – but the club had been waiting on international clearance from FIFA in order to be able to confirm the additions. Centre-back Donker featured as a trialist in the Under-20s most recent Development League clash. The 20-year-old has also trained with SPFL League One side Livingston this season and arrived in Scotland following a spell with Dutch side SV Nieuw Utrecht. Winger Kessells, born in Brazil but holds a Dutch passport, joins from Wilhelmina ’08, a club based in Weert, a southern city in Netherlands.